In general, the higher an oil’s TBN, the better its ability to neutralize contaminants such as combustion by-products and acidic materials. Higher TBN oils neutralize a greater amount of acidic material, which results in longer oil life and cleaner engines. The Total Base Number Test (ASTM D2896) uses a series of chemical reactions to measure the alkaline additives in a motor oil. We recognize the value of formulating motor oils with high TBN, and AMSOIL Signature Series Synthetic Motor Oil features the highest TBN of the oils tested. AMSOIL Signature Series is fortified with a heavy treatment of detergent additive and it delivers 30% more acid neutralizing power1 than Mobil 1, and 36% more than Royal Purple, helping engines to stay cleaner, longer. AMSOIL synthetic lubricants feature a large dose of quality additives that consistently deliver high TBN for the life of the oil. They neutralize acidic contaminants and keep them in suspension to maximize engine protection. 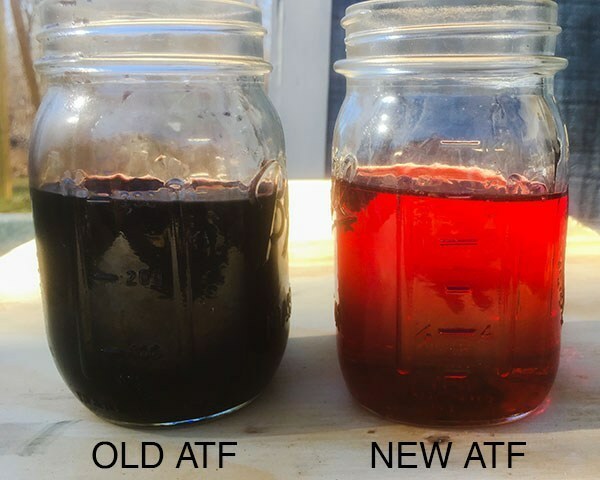 AMSOIL lubricants use detergent and dispersant additives to significantly reduce sludge and carbon deposit formation. 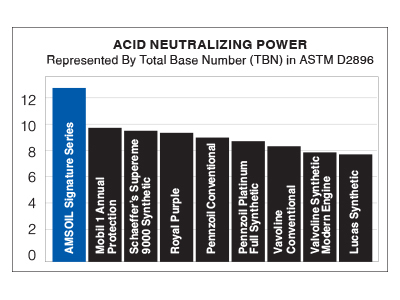 In the Total Base Number Test (ASTM D2896), AMSOIL Signature Series 5W-30 Synthetic Motor Oil demonstrated the highest TBN of the oils featured in the test, helping it deliver reliable protection for extended drain intervals. 1Based upon independent testing of Mobil 1 Annual Protection Full Synthetic 5W-30, Royal Purple High Performance 5W-30 and AMSOIL Signature Series 5W-30 in ASTM D2896. Oils purchased 05/03/18.